M T D O c t o b e r 2 0 1 8 40 QUESTION: In which applications and fitments do you recommend using rubber tracks vs. tires? What are the performance differences in terms of traction, fuel economy, soil compaction and roading between the two? (Editor's note: Bridgestone Americas Tire Opera- tions LLC, through its Firestone Ag Division, and Continental AG, through its ContiTech subsidiary, offer both tracks and tires.) Bradley Harris, manager of global agricultural field engineering, Firestone Ag Division, Bridgestone Americas Tire Operations: Just like asking if apple or orange juice is better, asking if tracks or tires are better systems comes down to customer preference. Both systems have pros and cons, so it is important to understand the facts and benefits about each system and determine which is best for your operation. In many operations, it could be a combination of both systems. When I ask users why they have tracks, the number one response I get is, "I want to get rid of compaction and the track has a much larger footprint area." While it is true the total footprint area of a track is larger than a tire, the weight of the machine is not equally distributed under the track. When measuring the contact pressure of the track system, there are pressure spikes under each one of the boggy wheels. In wet or moist soils, the soil is damaged by the highest contact pressures, which would be under those boggy wheels. Firestone Ag has conducted studies on soil contact pressures on two- and four-track sys- tems and wheeled tractors and has published technical papers with the American Society of Agricultural and Biological Engineers (ASABE). e results show: • If the inflation pressure of the tires is less than 20 psi, tires transmit less contact pressure to the soil compared to tracks. • From 20 to 35 psi, the tracks and wheel systems were comparable. • If the inflation pressure of the tires is above 35 psi, the track system had lower contact pressure than the tires. However, there is still the perception that tracks reduce soil compaction when compared to tires in all situations. What we have heard, anecdotally, is that the absence of a rut in the field means there must be no compaction. In wet soils, it does not matter which system is being used – compaction occurs with or without ruts. e rutting is a function on how the wheel and track system operate differently. A tire rotates and the tire lug needs to pull the tractor forward. e rotation of the tire causes a wave in front of the tire, and the tire is climbing out of the rut in wet soils. e lug on the track system is planted in the soil and the tractor is pushed forward. With the track system there is not a wave of soil, so the track lug isn't trying to climb out of a rut. When looking at traction, track systems are most efficient at 0–3% slip, while wheeled systems are most efficient at 5–9% slip. e lower slip range of the track system does give users more traction in the field, but that does not result in less fuel used. A track system takes more horsepower to rotate the track, which results in higher fuel consumption. When comparing a tracked tractor to a comparable wheeled tractor with the proper inflation pressure, they both will use similar amounts of fuel to complete a task. If the tires on the wheeled tractor are over inflated, that tractor will not develop the proper footprint, which results in less traction. In this scenario, a tracked tractor would use less fuel. For traction and fuel usage, both tractors will have similar fuel costs. When transporting tractors on the road, a wheeled tractor can operate in the 25 to 30 mph range, while tracked machines are limited to 20 mph. e faster road speeds are better for minimizing wasted time between fields. However, the narrower width of a tracked tractor makes driving on the road less stressful compared to a 4WD tractor James Tuschner By Modern Tire Dealer has partnered with AG Tire Talk to provide answers to the insightful questions farm tire dealers have about farm tire technology. is is the fih in a series, which is designed to help agricultural tire dealers better connect with their custom- ers. 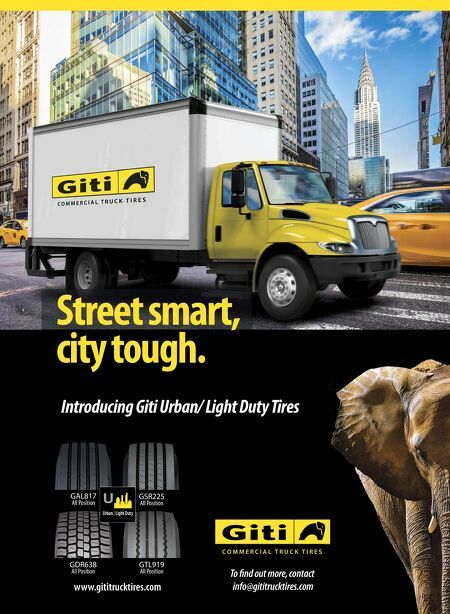 A trending question followed by an abridged version of the answers will appear in our Commercial Tire Dealer section every other month; for the complete answers, check out www.agtiretalk.com! 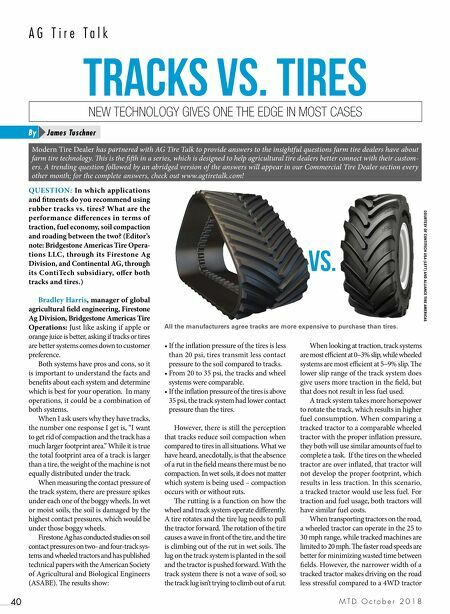 NEW TECHNOLOGY GIVES ONE THE EDGE IN MOST CASES All the manufacturers agree tracks are more expensive to purchase than tires. A G T i r e T a l k Tracks vs. tires COURTESY OF CONTITECH USA (LEFT) AND ALLIANCE TIRE AMERICAS vs.